139 years after his birth, Sir Alfred Munnings remains one of the world’s greatest equestrian artists. From cart horses and gypsy nags to war horses and famous stallions, these elegant animals defined Munnings’ career and arguably led him to a life of eventual fame and fortune. To celebrate his birthday today, we’re looking back at Sir Alfred’s life and career, how he developed his bold and recognisable style, where he found his inspiration, and how he came to be known as Britain’s finest painter of horses. Born to the miller at Mendham Mill in Suffolk on the 8th of October, 1878, Alfred Munnings seemed set to become an artist from a very early age. At just eight years old he began taking drawing lessons from the parish vicar’s daughter and, at 14, he was apprenticed to a printmaker and lithographer – attending the Norwich School of Art in his spare time. Growing up in a mill, Munnings was used to seeing horses on a daily basis and, after his apprenticeship was completed, would go on to paint them prolifically while visiting horse fairs and farms. It was during this time that he perfected his signature East Anglian rural scenes, a fascination with the movement, power and elegance of the horse his most frequent subject. Inspired by the famous painter of horses and one-time mentor, George Stubbs, Munnings also found much to influence him in the en plein air realism discovered while studying at the Academie Julian in Paris and the realism of the Munich art scene, which he experienced while attending trade fairs as an apprentice. After having two of his paintings featured in the 1899 Royal Academy Summer Exhibition, Munnings became associated with the Newlyn School of Painters – alongside peers such as Laura and Harold Knight – and there met his first wife, Florence Carter-Wood – a short-lived marriage that ended in tragedy when ‘Flossie’ first attempted suicide on their honeymoon and then succeeded in taking her own life in 1914. Perhaps in an attempt to escape this period, a time which he famously refused to talk about afterwards, Munnings tried to enlist in the Army after the outbreak of World War I, but was rejected due to his loss of vision in one eye as the result of an accident in his youth. Instead, he was given a civilian job processing Canadian horses, from which he moved to a horse remount depot on the Western Front, and then was eventually hired as the war artist for the Canadian Cavalry Brigade. It was his time as a war artist that would lead to his big break, after a portrait of General Jack Seely on his his horse led to a spate of further high profile commissions, including a famous portrait of the Grand National-winning racehorse, Poethlyn, in 1919. Later that year, he would become a fellow of the Royal Academy. The years following the war were a time of fame and fortune for Sir Alfred, who would become famous for the high society commissions encouraged by his second wife, Violet McBride, whom he married in 1920. He was able to afford to buy the ‘house of his dreams’, Castle House in Denham, and would spend the rest of his career painting from its adjoining studio. In 1944, he became President of the Royal Academy of Art and a Knight Bachelor, going on to be named a Knight Commander of the Royal Victorian Order in 1947. However, Sir Alfred’s career was not without its controversy. His Royal Academy presidency is perhaps most famous for a BBC-broadcasted speech in 1949 where, under the influence of alcohol, he attacked fellow artists and decried modernists, such as Picasso and Matisse as ‘affected… foolish daubers’ before publicly resigning. Somewhat damaged by the ensuing controversy, Munnings would nonetheless go on to paint right up to his death at home in 1959, after which his wife turned Castle House into the Munnings Art Museum. As popular now as he was during the height of his career, Sir Alfred’s paintings continue to be desired by collectors worldwide, with recent auctions seeing his work sold for anywhere up to $7m. Sir Alfred lost the sight in one of his eyes after an encounter with a thorn bush. As well as painting, he made a name for himself as a sculptor and designed equestrian statues for both the military and sporting clubs, despite having no training in the medium. Sir Alfred’s first marriage to Florence ‘Flossie’ Carter-Wood is also the subject of some controversy, as a recent film based on the diaries of the couple’s mutual friend Captain Gilbert Evans suggested a love triangle between the three as the reason behind Flossie’s suicide. Before he gained recognition, Sir Alfred lived and worked in a travelling art studio that he set up in a gypsy caravan, one of the reasons why horses and gypsies are so often depicted in his earlier works. 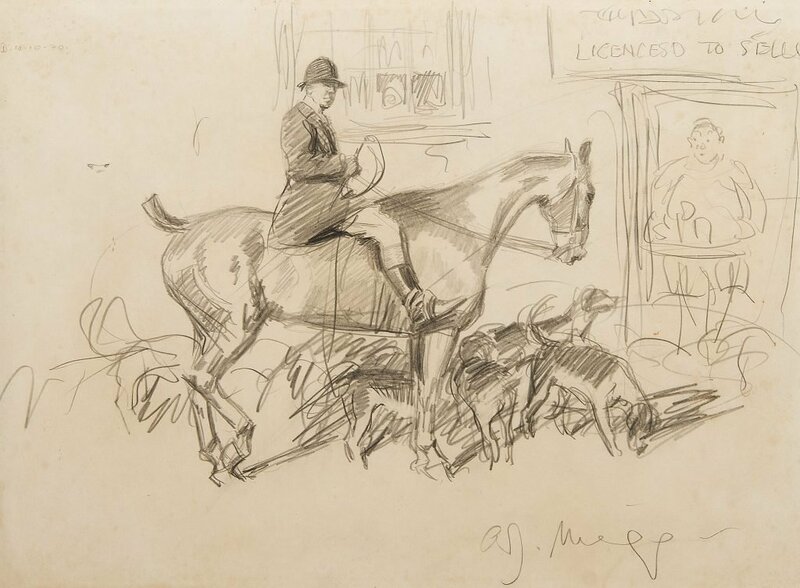 Sir Alfred Munning’s recent revival in popularity is particularly exciting for the team here at Trinity House, where we’re privileged to have for sale two original Munnings sketches, A Huntsman and Hounds and Ware Wire. A fascinating insight into the artist’s process, both sketches demonstrate his unique grasp of movement and narrative as well as his mastery of the equine form. For more information on the artist and our collection, visit our Sir Alfred Munnings page.